First Line: Du Pré's sleep dissolved; he heard bacon sizzling in a pan, he rolled to Madelaine and found her gone. Madelaine's son, Chappie Plaquemines, hasn't had an easy transition from serving in Iraq. 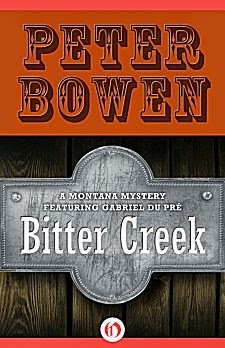 When his lieutenant comes to Montana to convince Chappie to accept a medal, he and Du Pré have to find him first. Once he's located, a trip to a sweat lodge is in order, and it's there that things become a little strange. Otherworldly voices within the lodge begin talking of a place called Bitter Creek and of a band of Métis who were last seen trying to escape from General Black Jack Pershing's men in 1910. The men decide to look for Bitter Creek, which leads Du Pré to the last living survivor of the massacre. Led by the frail, ancient woman, Du Pré finds that he and the others are about to uncover some long-buried secrets that no one in the area wants brought to light. Chappie, Patchen and Du Pré know what they're getting into, but they also know that the massacre victims deserve both justice and to finally rest in peace. I have long been a fan of Peter Bowen's series. It's been several years since the last book (Nails) was published, so I was thrilled to see this one. It brings back everything I love about these books, although some of those things might not be for everyone. Bowen writes about the Métis, a group of mixed French and Native American people, living in the wilds of Montana. The author does an excellent job in giving us a feel for the pidgin English they speak. The words that are left out give the Métis' speech a French cadence that is part of their heritage. I love it, but I can see why it might prove to be an annoyance to other readers. The Métis also often have outspoken views and ways of doing things. For instance, Du Pré's grandchildren are growing up to be fine human beings despite parenting of which many modern experts would disapprove. The Métis are a proud people-- independent spirits-- and for all intents and purposes, they are left alone now, mostly because they live where no one else wants to. Bowen has created an excellent cast of characters that I love to read about. The old cowboy Booger Tom is the focus of most of the humor in Bitter Creek, thanks to a water buffalo named Eustace. The war between those two is hilarious. The focus of this book is the 100-year-old mystery of exactly who was responsible for the massacre of the band of Métis trying to escape to Canada, and Du Pré and the others are dealing with the descendants of the people who were probably responsible. This creates a lot of tension as the story progresses because the reader is never certain what those people are willing to do in order to keep century-old secrets buried. Those scenes of Booger Tom and Eustace provide much needed levity. There's also a modern-day murder in Bitter Creek, but it definitely takes a backseat to the old mystery. In fact, it almost feels tacked on-- as if Bowen wanted to prove that not all country sheriffs are stupid (and they're not). I loved spending time with Du Pré and the others. I've missed them-- and I'm hoping that Bowen may have a Montana story or two left to tell us in the future.